2. Hippopotomonstrosesquippedaliophobia is the fear of what ? 3. The 'Privilege' is the world's largest disco with a throbbing capacity of 10,000. This tourist goal is found on which European island ? 4. First published in 1390, the 'Forme of Cury' is the oldest cookbook in the English language. One of the many recipes is "Pygg in Sawse Sawge". Translate that. 5. The planned construction of a 1km high, multi billion dollar luxury tower in Dubai will take how many years to complete ? 6. 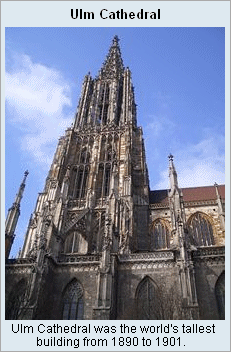 With 161.5 m., the tallest church tower in the world is found in which German city ? 7. True or false. There is a patron saint for haemorrhoid suffers? 8. Gingiru, Lupa, Moana-ngoma, Musette and Virginal are all examples of what ? 9. A standard European condom can hold how many litres of water before it bursts ? 10. Keith, Safe, Amicable, Prime, Supersingular, Carol, Highly Cototient, Atomic, Thabit, Natural and Strictly Non Palindromic are all examples of what? 2. Long words Comes from hippopotomonstrosesquipedalian, an extension of sesquipedalian with monstrum "monster" and a truncated, misspelled form of hippopotamus, intended to exaggerate the length of the word itself and the idea of the size of the words being feared; combined with phobia. The word consists of 35 letters. It is unlikely that this 15-syllable contrivance is ever used purely for its meaning. The term sesquipedaliophobia is recognized in formal writing, while the four-syllable phrase "fear of long words" is certainly worth considering. 4. Pig in sauce sage. (sage sauce) The Forme of Cury, so named by Samuel Pegge, was a roll of cookery written by the Master Cooks of King Richard II of England. This name has since come into usage for almost all versions of the original manuscript. It is by far the most well known medieval guide to cooking. The roll was written in late Middle English on vellum and details some 205 recipes (although the exact number of recipes varies slightly between different versions). 6. a. Ulm (Ulmer Muenster) Ulm Cathedral (German: Ulmer M?nster) is a Lutheran church, the tallest church in the world, with a steeple measuring 161.53 m (530 ft) and containing 768 steps. Located in Ulm, Germany, the church is not a cathedral in the technical ecclesiastical sense, as it has never been the seat of a bishop. (The responsible bishop of the Evangelical Church in Germany resides in Stuttgart.) However, it is a famous example of Gothic ecclesiastical architecture and is typically and mistakenly described as a cathedral. After climbing to the top level at 143m there is a panoramic view of Ulm in Baden-W?rttemberg and Neu-Ulm in Bavaria and, in clear weather, a vista of the Alps from S?ntis to the Zugspitze. The final stairwell to the top (known as the 3rd Gallery) is a tall, spiraling staircase that has barely enough room for one person. Like the famous Cologne Cathedral (K?lner Dom) - another building of the Gothic era - the Ulm M?nster was not completed until the 19th century. 10. A number or numbers.